I just finished reading China Miéville’s Embassytown. Wow, what a trip. I love this guy – not just because of his beautiful skull (seriously… he has such great skull architecture right?) but also because he is cuh-razy good at world-building and the slow reveal. I loved how all of the initially unexplained details in the first half of the book clicked into place one by one, revealing the world and its inhabitants more and more vividly as I moved through it. Hosts, the indigenes, in whose city we had been graciously allowed to build Embassytown, were cool, incomprehensible presences. Powers like subaltern gods, who sometimes watched us as if we were interesting, curious dust; and who provided our biogigging; and to which the Ambassadors alone spoke. The Hosts are polyvocal (they speak with “an intertwining of two voices”) and cannot separate communication or even thoughts from reality, which means they take everything literally and cannot lie. Humans can only communicate with them through specially engineered “twins” (Ambassadors) who can speak with two voices and one mind. So, that’s the set up. We’re told the story as a first-person autobiography by the protagonist Avice Benner Cho, who, as a child, became a simile: a living example of a figure of speech for the Hosts to use in their communication. The first half of the book alternates between two timelines, Avice’s childhood and the latter-day events. Then, around the middle of the book, the two chronologies meet up, neatly interweave, and carry on as one. This was a sweet move on Miéville’s part as it meant he got to drip-feed us all the back-story and describe the world in detail while keeping us engaged with the rising tension of the main plot (which needed all that in-depth world building to progress). 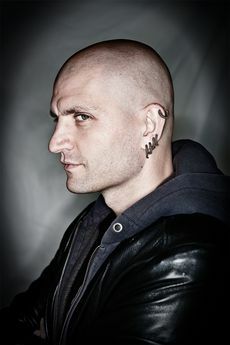 If you know Miéville’s writing, you know these realistic fantasy worlds filled with fascinating sub-cultures, twisted politics, and vivid visuals are what he does best. He really knows how to make good brain candy. The early chapters might seem a little disorienting at first because you are dropped straight into the world without many explanations for how it all works, but stick with it; you can trust this guy. Here is a piece from early in the book, describing Avice’s childhood in this alien, biorigged world. In our usual spot, there was a Hostnest in fine alien colours tethered by creaking ropes of muscle to a stockade that, in some affectation, the Hosts had fashioned like one of our wicker fences. I’d creep up on it while my friends whistled from the crossroads … I’d hold my breath and go forward on a lungful through where the airs mixed – past what was not quite a hard border but was still remarkably abrupt, a gaseous transition, breezes sculpted with nanotech particle-machines and consummate atmosphere artistry ­­– to write Avice on the wood. Once on a whim of bravado I patted the nest’s flesh anchor where it interwove the slats. It felt as taut as a gourd. I ran back, gasping, to my friends. The story is essentially about language and how it can be used, and about what happens when the fragile communication between the humans and the hosts starts to break down. But how this actually plays out on Arieka and what it means for the different species there I will leave to Miéville to show you in his own good time.